After a 240km drive from Manali and crossing snow clad Rohtang-La & Baralacha-La was the first halt on our Leh Roadtrip – Sarchu . 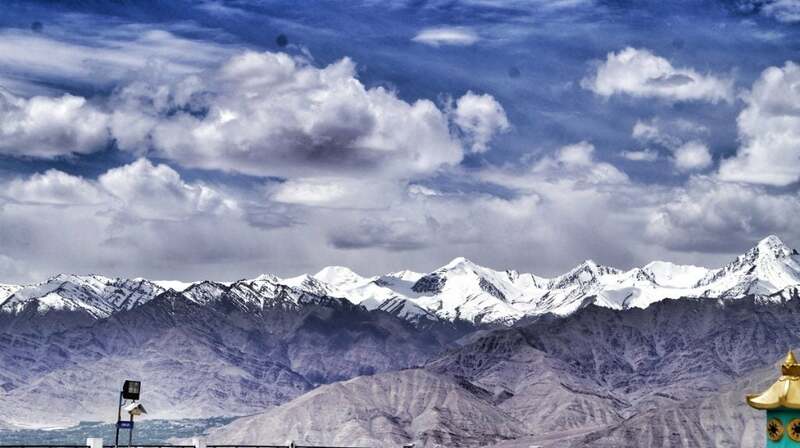 Sarchu is one of the most preferred halt on this route, it lies just at the border of Himachal Pradesh & Jammu & Kashmir at an altitude of 14,300 feet. The entire landscape around Sarchu is mesmerizing & pict. Above all one should be prepared for a chilly night while staying here due to the influence of the winds from Baralcha-La & Sarchu’s altitude itself. 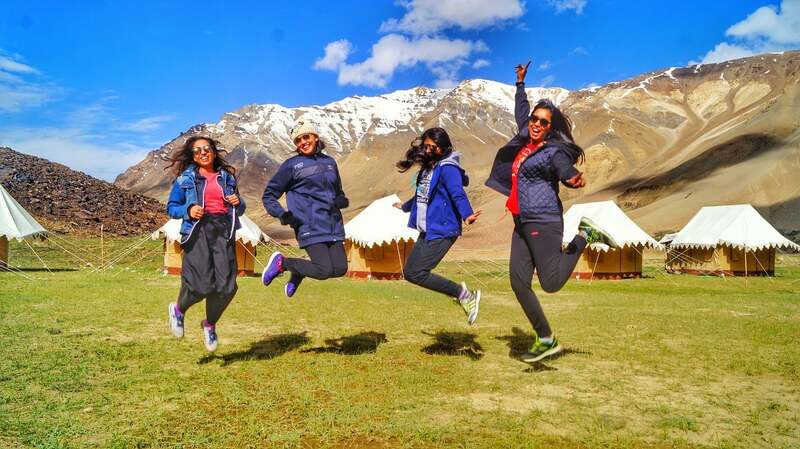 It was an amazing as well as extreme experience for all our fellow wravelers as everything just turned into gold once the sun rays touched the mighty land at Sarchu in morning and we were again all set for our journey towards Leh. 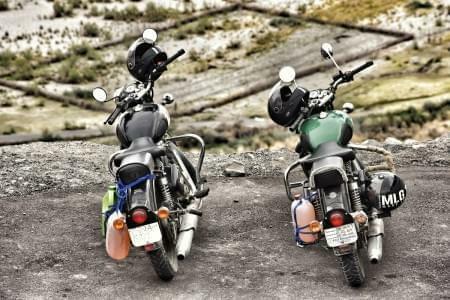 Gata Loops is a name that is unknown to everyone except for a few who have traveled on the Manali Leh highway. 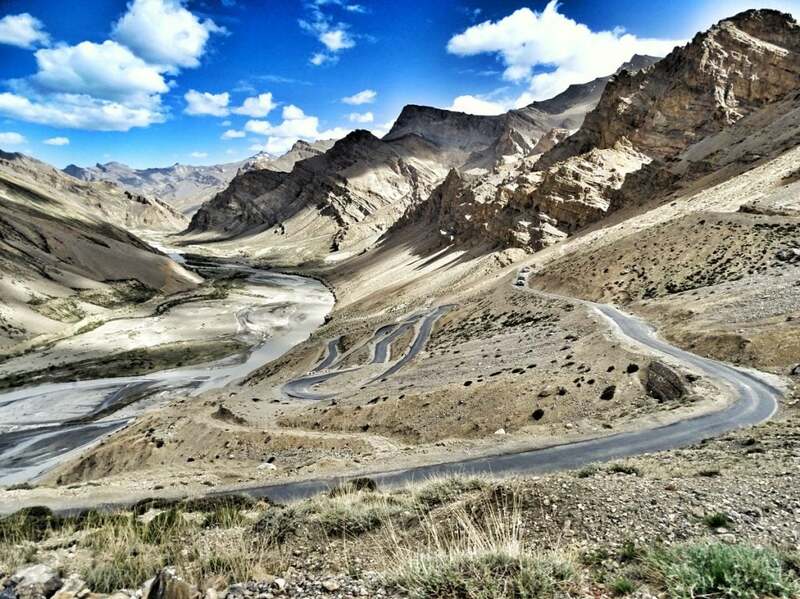 It is a series of twenty one hairpin bends that takes you to the top of the 3rd high altitude pass on this highway, Nakeela, at a height of nearly 16000 ft. People who do know the name Gata Loops know it because of its stunning location, breath taking scenery around it and the difficult ascent. But that is not all, there is also the ghost who haunts these loops that only a handful know about. Several years ago, it was late October when a truck with its two travelers, the driver and a cleaner, crossed Rohtang and moved on its way towards Leh. It had already started to snow at a few places and the driver was warned but he had no choice. He had a time-line and had to reach Leh which meant that it was too late for him to turn back and take the Srinagar Leh highway which was still comparatively safer. It was the last truck to cross Rohtang as it snowed heavily the very same evening at the top and the pass closed. Kunzum Pass was already closed weeks ago and there were no vehicles coming from Kaza as well which means that it was the last truck plying on Manali Leh highway. The driver managed to bring the truck safely all the way to Gata Loops but this is where disaster struck. On one of the loops, his truck broke down and came to a complete halt. After trying for hours, the driver couldn’t fix whatever was wrong with the vehicle. They waited and waited but no one crossed them by because they were the last vehicle on the route. so the driver decided to walk to a nearby village and get some help. Cleaner however was ill and not in a condition to walk. He was so terribly ill that he could barely stand up but what was he suffering from our narrator couldn’t tell. To add to this, Truck was also loaded and could not be left abandoned with the cargo because of the risk of getting robbed hence the cleaner stayed back with the truck to guard it and also because he was in no condition to walk. The driver walked and walked for miles until he found a tiny village but Alas, there was no mechanic there. He somehow managed to make a phone call to Manali to get someone to come and fix the truck but to his bad luck, while he was still waiting at the village, the weather closed in. It started to snow heavily and became impossible for the driver to get back to the truck. It took several days for the weather to clear and he was stranded in the village all this time. Finally help came from Manali and they all hurried back to Gata Loops, to the spot where the truck broke down only to find the cleaner dead. Poor chap was left alone on the road for several days in freezing temperature, in poor health, with no water and nothing to eat and eventually died of thirst, hunger and cold. The truck was fixed but it was impossible to drive it either to Leh or Manali because passes on both sides were closed. So the driver drove the truck to the village he was stranded in and waited there until it was possible to drive across Rohtang and return to Manali. The body of the cleaner was buried at Gata Loops by the villagers, right at the spot where he died. Next year when the highway reopened, people started noticing a strange thing. There was a beggar at Gata Loops who would waive at the passing vehicles to stop and begged them for water. Some people did not stop but the ones who did and offered the beggar some water saw the bottles drop right through his hands. The word spread and sure enough people were scared of the ghost who begged for water, thinking that it might harm them if they stopped or curse them if they didn’t. In order to pacify the ghost, the locals set up a small temple at the spot where he was buried and made offerings of water. Since then, whoever passes by and is aware of the story leaves some water at the temple, as an offering. Leh (the earlier capital of the royal kingdom of Ladakh) is situated at an altitude of 11,500 feet. Julley is the common word used here for greeting each other, but what makes this word more charming is the smile on the face of the locals while giving you a warm welcome to the land of passes and a culture that attracts people from around the world every year. 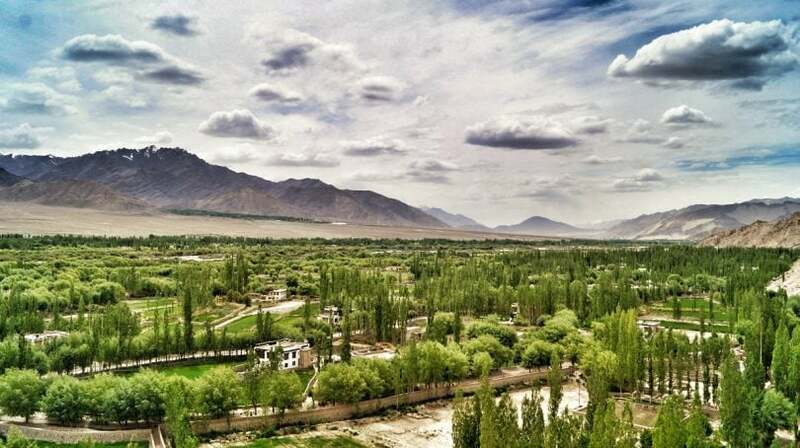 Leh is accessible to the world by road only for a few months, this is the reason the locals have backyard farms to grow and gather supplies for the rest of the year. 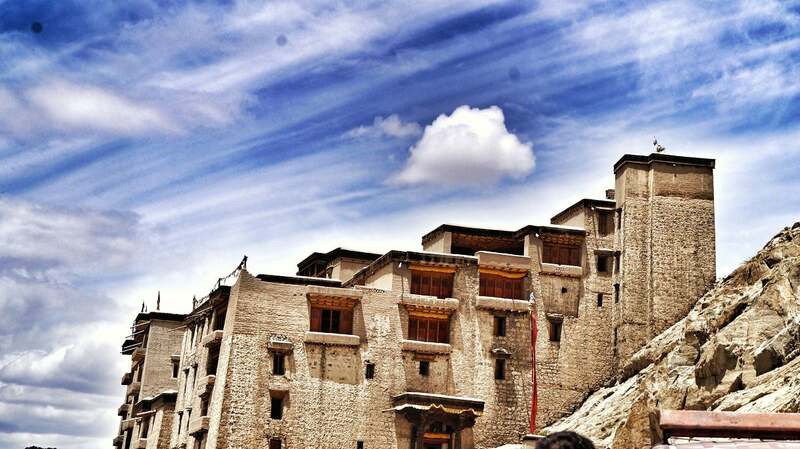 Leh had many architectural wonders that were loved by our fellow wravelers thoroughly. The Leh Palace itself is located on a cliff keeping the watch over the entire city, built in the same style and about the same time as the Potala Palace- the chief residence of the Dalai Lama until the 1959 Tibetan uprising. 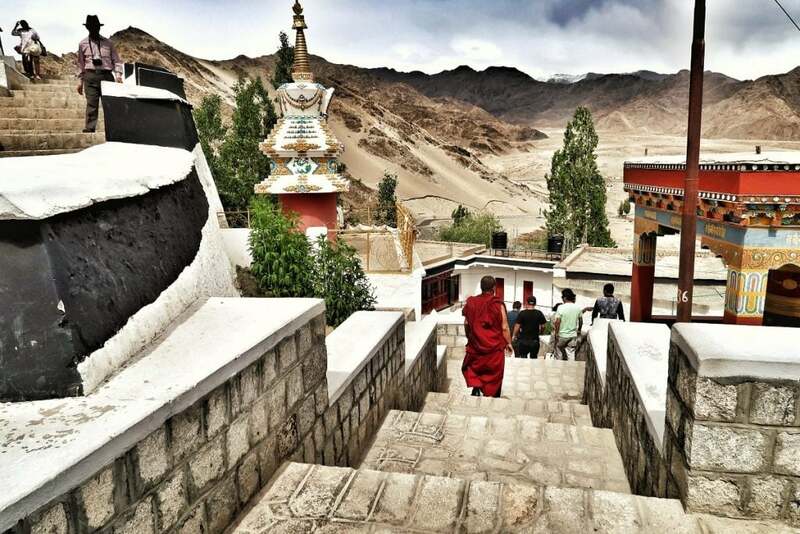 Other places that one should pay a visit around Leh include beautiful monasteries such as Thiksey, Hemis and Shey Palace. 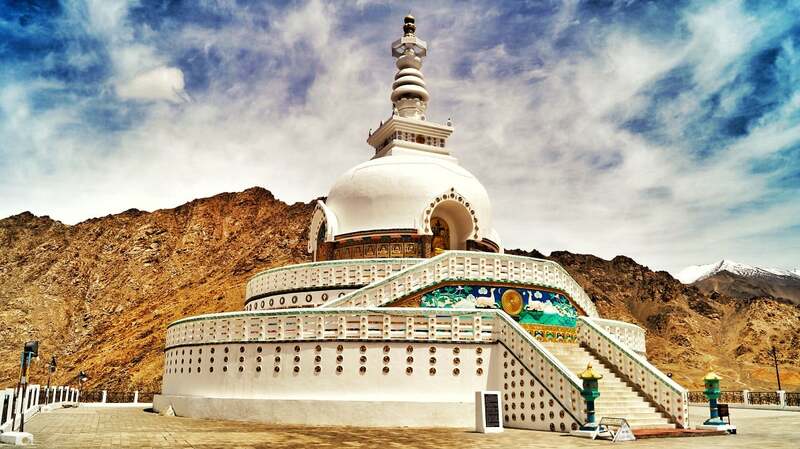 The Shanti Stupa & Leh Main Market including the famous Changspa lane are also a part of the travellers bucket list. 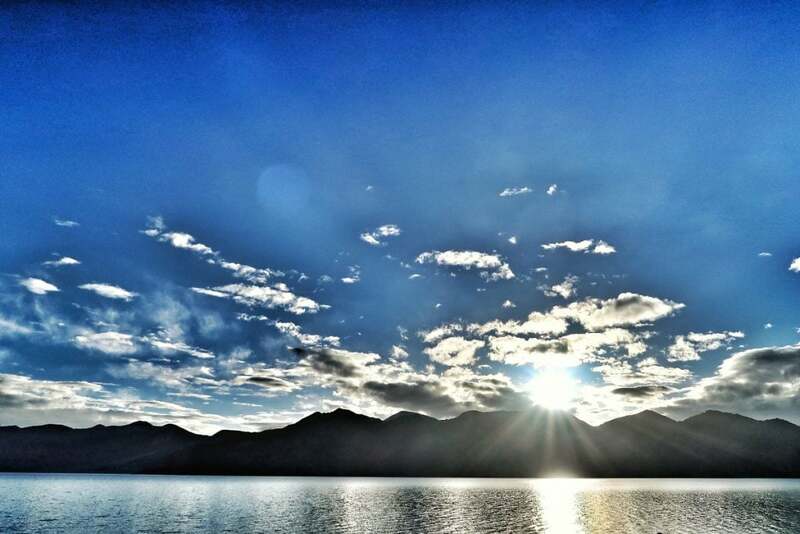 Pangong (high grassland) Tso (lake) is situated at an altitude of 14,270 feet and extends from India to China out of which approximately 1/3rd part of the lake lies within Indian province. 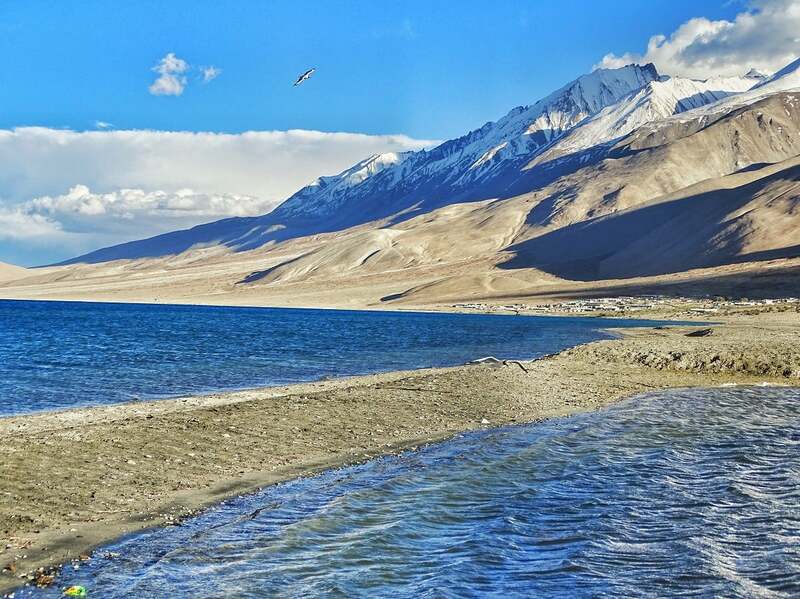 It is also the world’s highest salt-water lake and after the Sino-Indian Border dispute the Line of Actual Control passes through it thus, while traveling to this wonderful masterpiece of nature one requires an Inner Line Permit which can be obtained easily from the Tourist office in Leh for a nominal fee. Although if you are wraveling with us we got it all covered J. Another magical fact about the lake is that it freezes during the winter despite being a saline water lake. Our fellow wravelers were extremely excited to visit this blue carpet of waves created by the mountain winds. Pangong can be easily reached from Leh in a 5-6 hour drive while crossing Chang La and the Pagal Naalah enroute. 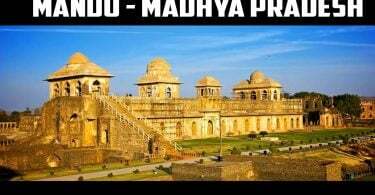 Many famous Bollywood movies have been shot here and this is another reason why it attracts a huge crowd of visitors every year but the most important reason is it’s endless beauty and picturesque landscape. It is a jackpot for the shutterbug community as after mid noon Sun is around the back to give you the perfect light conditions for that amazing shot. The locals earn through camps and local restaurants during the peak season and during the off-season they hibernate to Goa to work at shacks on beaches. Another reason why Ladakh is so famous amongst the shutterbug community is the night sky with endless stars. 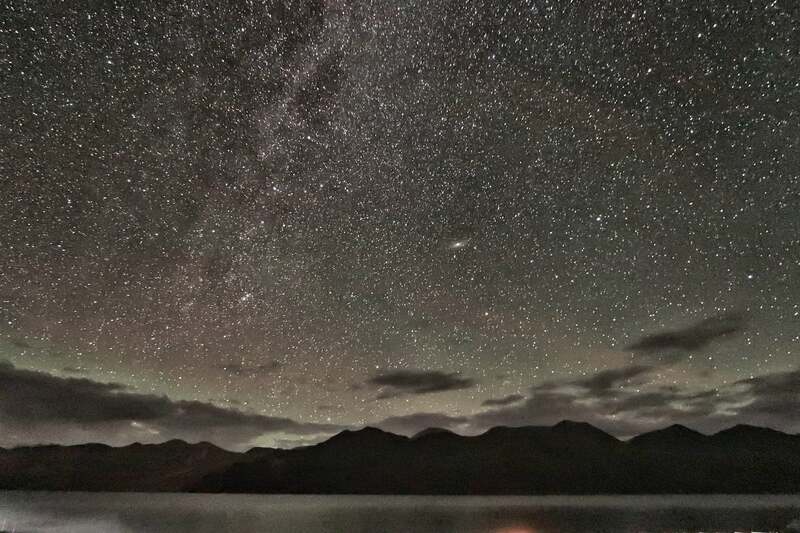 These stars make us believe, that we exist and what adds to this heavenly feeling is the dark outline of the Himalayas with the night’s calm making you interact with your inner self. The cherry on the cake is the first look of Milky Way trailing all down to those dark outlined ranges from top of your head. Galileo Galilei once quoted – “The Milky Way is nothing else but a mass of innumerable stars planted together in clusters” and these innumerable stars of the milky way which are easily visible from Ladakh make you forget the Chilly night behind, and you spend the rest of the night gazing the bright mystical cluster” say our Wravelers who spent their night capturing this heavenly view sitting next to a self-made bonfire for the rest of the night. ‘La’ means pass in Tibetan. 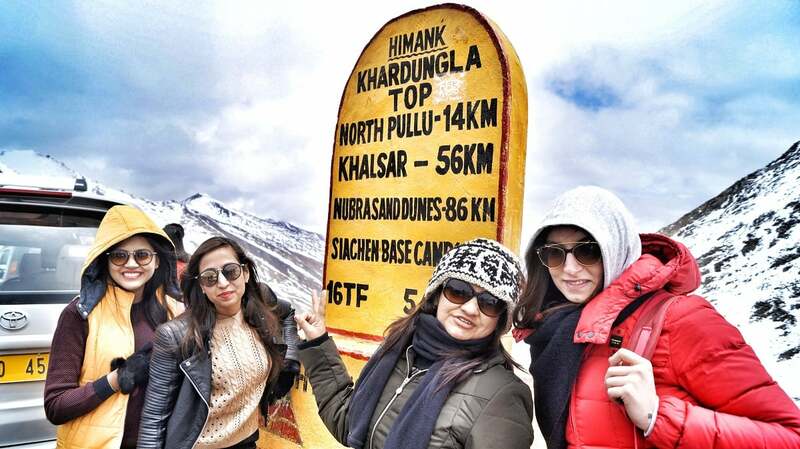 Khardung La is one of the high altitude passes in Jammu & Kashmir region & was incorrectly claimed to be the ‘Highest Motorable Road in the World’ according to the local summit signs. The average temperature of Khardung La is 7 degrees during the day and -9 at night during the summer months whereas it can also go as low as -36 degrees during the month of Jaunuary when it is completely covered with snow and is inaccessible. Khardung La houses a memoir shop, a medical camp and a few tea and maggi points controlled by the Border Roads Organisation and connects Leh to Diskit Monastery & Nubra Valley. Both the ends of the pass have checkpoints with basic amenities where one can enquire about the weather at the pass and whether chains need to be attached to the tyres or not. These checkpoints known as North & South Pullu grant access after verifying the travel permit that can be attained by travellers & riders. One can often expect a sudden change of weather while traveling towards the pass in form of hailstorms & snow just like our fellow wravelers did. They were welcomed by heavy snowfall while traveling towards the pass from Nubra. Khardung La pass is situated at a high altitude with a rough terrain and is also considered to be one of the base camps of Siachin. One should always take precautions for AMS and Snow Blindness. Ever though of those cute little monks hanging around the monasteries you’ve visited? Bhikkhu is the term used for monk in Buddhism. These monks live in monasteries and these also act as educational institutions to them where they follow a certain routine just like in a boarding school with various activities including religious activities, basic education, sports etc. They follow the sound of the gong or the Tibetan Drum that one can find in the monasteries as their alarm for various day activities. Few monks decide to stay in the monastery just for a few years whereas few choose to live an ascetic life for the rest of their lives. 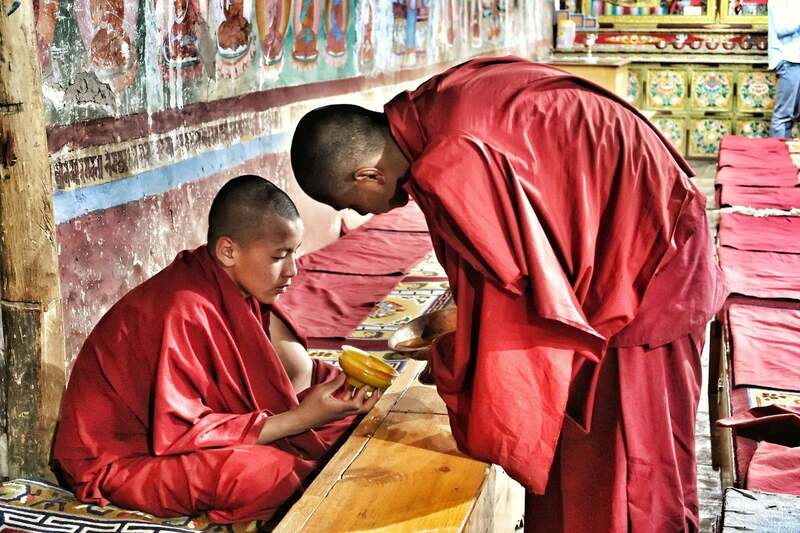 These monks take vows which are taken in order to develop one’s own personal ethical discipline. After the first 5 vows the next step is to enter the monastic way of life i.e. wearing robes and become a novice. The next and final step is to take all the vows to become a fully ordained monk. Ladakh makes you experience this life from really close, although these monks don’t generally interact as they are a bit shy and don’t talk to much but a few monks in monasteries can sit with you and provide you with all the information you would like to enquire about their lives which is an amazing experience. If lucky, you can also get to see one of their services to god which involves chanting mantras followed by sounds of different musical instruments. 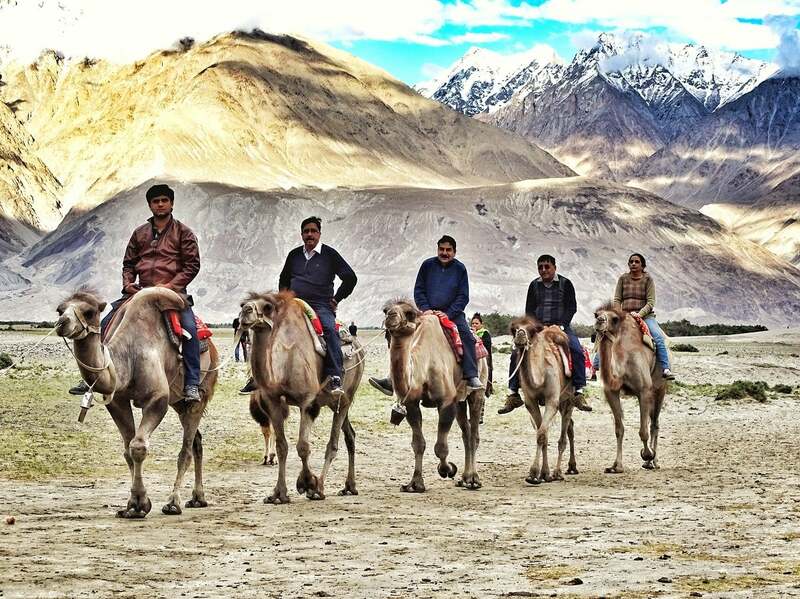 Nubra valley is located at an altitude of 10,000 feet. The common way to access the valley is via Khardung La pass from Leh. It is approximately 150 Kms. In distance from Leh and the drive-time is around 4 hours. 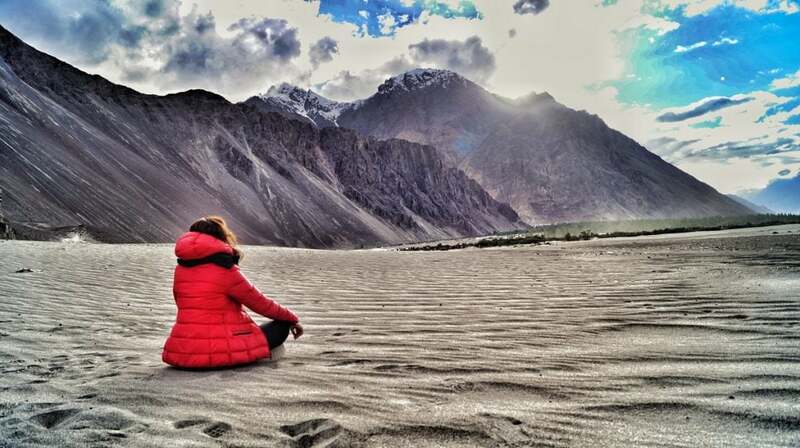 Nubra is a high altitude cold desert where one can experience the different moods of mother nature. It’s like experiencing all the different parts of the world together at one place. Starting from the lower horizon standing on the white sand dunes at Hundar with the river flowing on your side and moving up with a desert landscape followed by tall green vegetation snow clad mountains and the blue indefinite sky. While traveling to Nubra from Diskit one can also try a local café called Friends Café located at Diskit town on the main road towards Hundar. This café serves fresh made burgers and shakes with sauces and raw materials made from local vegetaion. We bet you haven’t tried a crispier burger before. The Siachen glacier lies to the north of Nubra Valley. 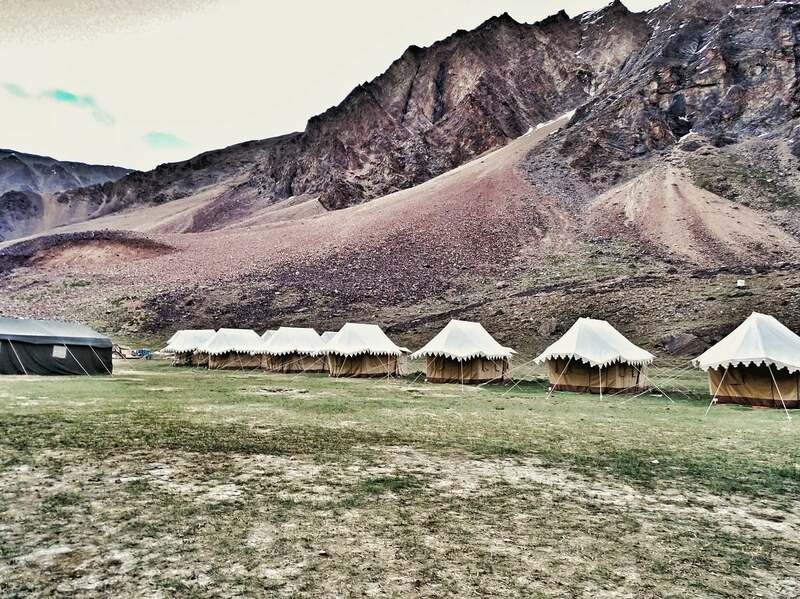 One can easily find bricked and camp type accomodations at Hundar for a comfortable surrounded by this scenic valley. Since April, 2017 the Inner Line Permit has been made compulsory for Indian citizens whereas foreign nationals would be needing a Protected Area Permit to visit Nubra Valley. Another major attraction of Nubra Valley are the rare species of Bactrian (double-humped) Camels that are found only in this region of the country. These camels have a tolerance for cold, drought, and high altitudes which enabled them to carry trade along the Silk Route. Our fellow wravelers instead of riding these poor mammals preferred to stick with the amazing landscapes and white sand dunes for their entertainment. They spend hours getting clicked in random poses and concluded the evening by watching the beautiful sunset together. Monastery are the architectural wonders of Buddhism. Monasteries are famous worldwide because of their huge size and picturesque architecture. In Buddhism monastery is known as Vihara and in Tibetan Buddhism they are referred to as Gompa. The word monastery is derived from a greek word which means ‘to live alone’ and that is what reflects the life of these monks. These monasteries are source of education and enlightenment to these buddhist monks who follow a certain routine involving them to learn more about their religion and meditation. They also learn about the ‘Circle of Life or The Jeevan Chakra’ and how one can stay connected to his own self with internal peace by learning through the teachings of Buddha. is the six syllable Sanskrit Mantra associated with the Shadakshari form of the Bodhisattva (the one who has attained Buddhahood for the benefit of all sentient beings. This mantra is commonly carved onto rocks called Mani, or else written on paper or cloth pieces which can be seen throughout the roadtrip. It is said when an individual spins the wheel of the Gompa or when the wind strikes the hanging peace flags it has the same effect as reciting the mantra enabling those positive vibes around you. Ladakh’s population comprises of people from all the religions out of which locals are generally Tibetan Buddhists. It is thus, surrounded by many beautiful monasteries such as Thiksey, Shey, Hemis where one can offer prayers, take a glimpse of this different culture or just meditate to connect to his/her inner soul. 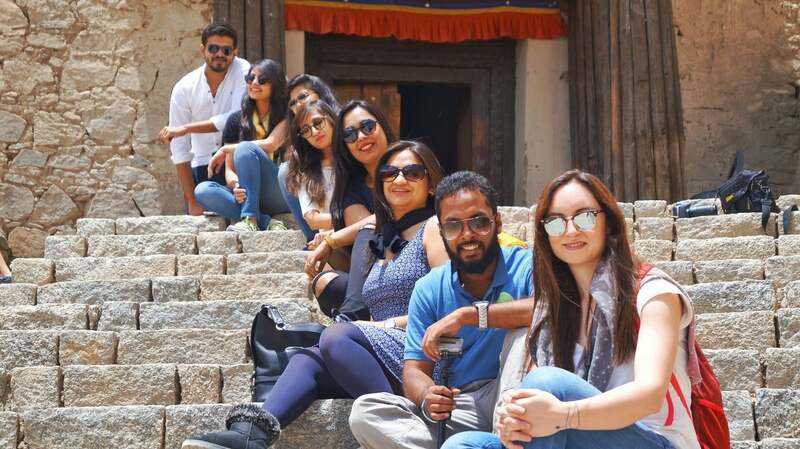 Our fellow wravelers took a city tour to all of these major monasteries and loved to gain knowledge and experience about this divine religion. 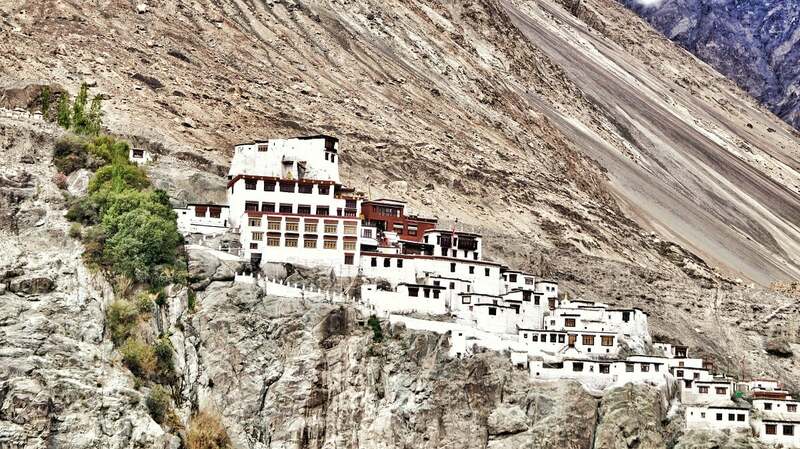 Diskit Monastery or Diskit Gompa is the oldest and largest monastery in the Nubra Valley of Ladakh. 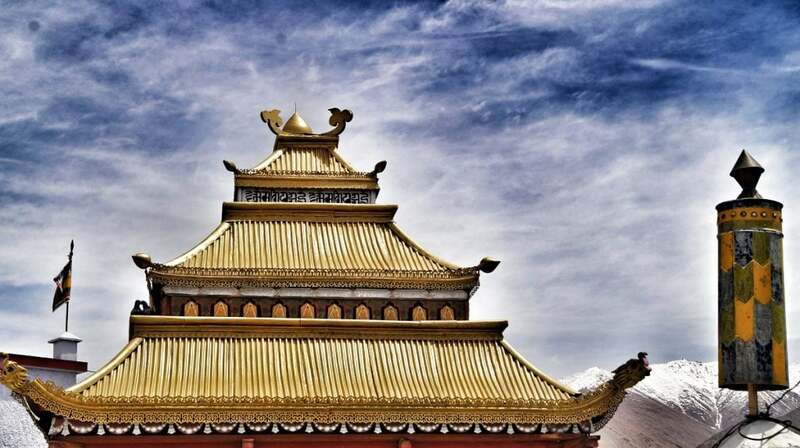 The monastery houses a school that is run by a NGO knows as “Tibbet Support Group” and a large statue of (Maitreya) Buddha which is approximately 106 feet in height. According to the monastery’s committee chairman most of the funds used in the building of this statue were donated by the locals themselves. One can see this statue from far away while travelling to Nubra and glance at its beauty. 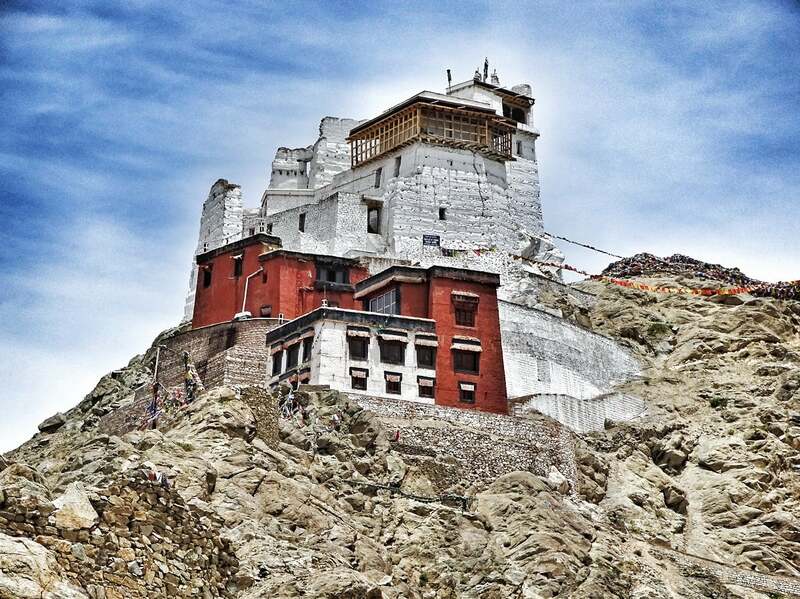 The entire monastery and the school is accessible and one should surely pay a visit to this amazing masterpiece. Another thing that make this statue special is the sunrise, during the sunrise you can witness a patch of sunrays just over the statue whereas the rest of the valley still waits to turn into gold. “It is liking living in a huge painting with ever changing backgrounds” – says one of our fellow wraveler, Shilpi Yadav. The 1700 Km. 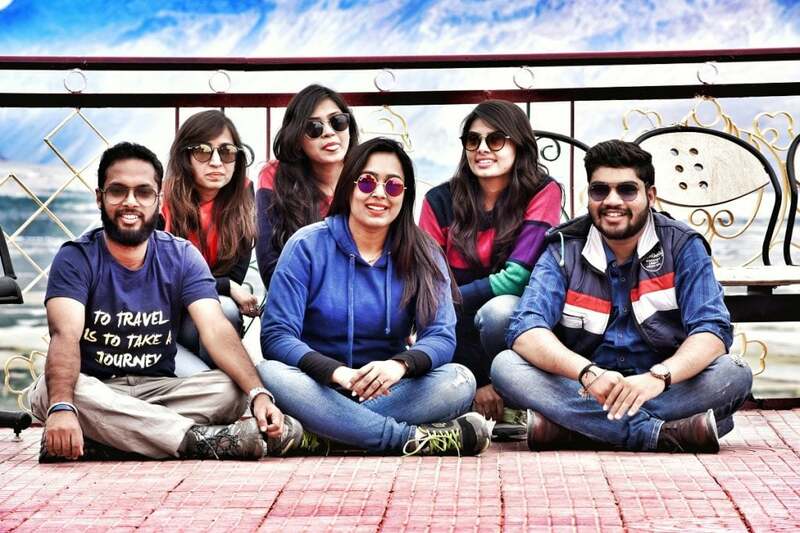 Leh road trip has one thing that makes it top every travellers bucket list and i.e. 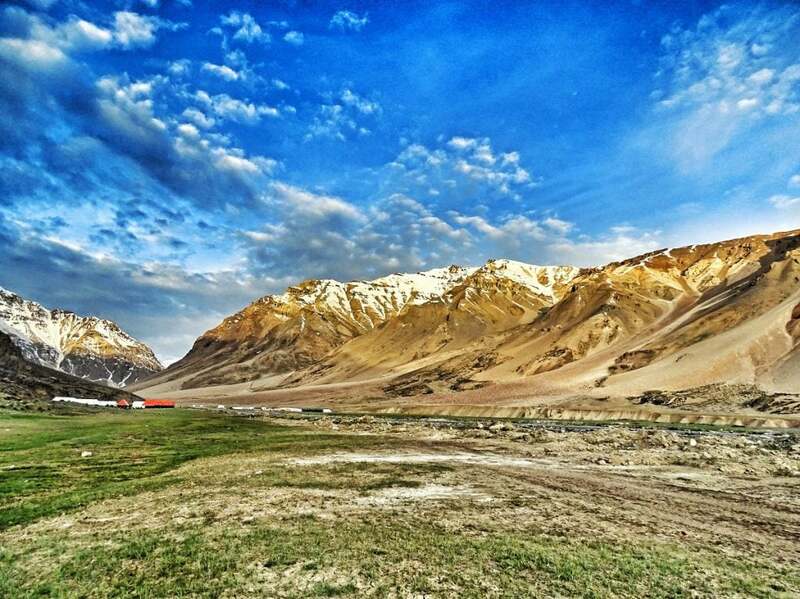 the ever-changing landscapes of the Manali-Leh Highway. It is also considered to be one of the most scenic highways in the world by travellers. A new horizon awaits you every minute on this 10-day long journey. 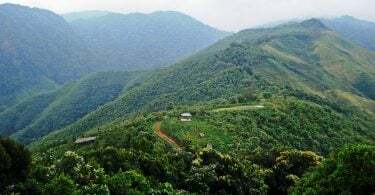 Whether it’s the snow-clad mountain ranges or the green vegetations patches on a few ranges. The raw touch of dust on the sky touching mountains with a waterfall created by the melting glacier who is shining bright white as the sun rays tap on it falling gently and striking those huge giant boulders on the mighty earth. These landscapes are going to leave you in awe of the nature and you won’t be needing any further reason or justification why it should not be preserved. We believe this is what happens when you start a journey to such an enchanting land or in other words heaven on Earth with a set of random strangers and while coming to the end of the journey share a precious unbreakable bond, this is what the magic of travel is. Since Day 1 our fellow wravelers started gelling up together and by the end of the trip it was like parting a family away to different origins. From dancing on the sand dunes to giving crazy poses, from teasing each other to singing song together. We Wravelers can make any place happening if we have the company of each other and we believe that is what a family is all about because family sticks together. Cheers to all the wravelers out there #wravelerforlife.